how to integrate the Bookitit's widget on Jimdo? Here we show how to integrate the online booking system and appointment at a website created with Jimdo . Integrating bookitit with Jimdo is also valid for the Pro and Business versions. 1. The first thing to do is have a website with Jimdo, you can put up your website for free here. 2. Add a new element on the page where you want your customers to make the reservation or appointment online. 3. Select the type of item you want to insert. 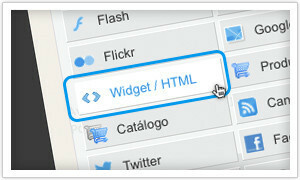 In this case you must choose “Widget/HTML”. 4. You can see a text box where you can paste the widget code bookitit appear. This code you can copy from within the application bookitit, once you have registered for free. You’ll find it in the control panel bookitit clicking on “Integration” Anyway here you can see a picture of what is the link you have to copy to insert the online booking system and appointment of bookitit with Jimdo. 5. Once you’ve copied the text you see in the picture above, you must paste it into the text box that you opened in Jimdo in step 3 and press save. 5. Congratulations! Your customers can now make an appointment online from your website with bookitit and jimdo 24 hours a day. You can insert theBookitit’s widget on all the web sites you need. Apart from the integration of Bookitit section if you click on the text that says “Want to see your widget working?” You can get the direct link to your booking widget to include it into your emails or communications. This link is not valid for pre-praid service PayPal, But to use the gateway Bookitit Payments. It can be activated from the Payment Gateway Control Panel section.